Samsung Electronics announced that it has begun mass producing the industry’s first 4-gigabyte (GB) DRAM package based on the second-generation High Bandwidth Memory (HBM2) interface, for use in high performance computing (HPC), advanced graphics and network systems, as well as enterprise servers. Samsung’s new HBM solution will offer unprecedented DRAM performance – more than seven times faster than the current DRAM performance limit, allowing faster responsiveness for high-end computing tasks including parallel computing, graphics rendering and machine learning. 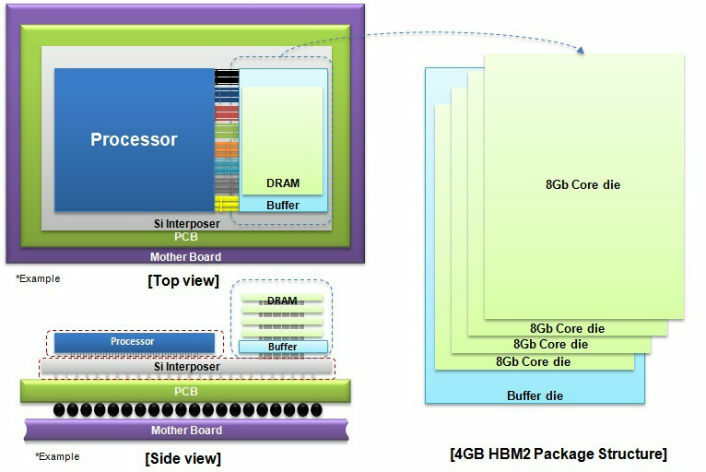 The newly introduced 4GB HBM2 DRAM, which uses Samsung’s most efficient 20-nanometer process technology and advanced HBM chip design, satisfies the need for high performance, energy efficiency, reliability and small dimensions making it well suited for next-generation HPC systems and graphics cards. Following Samsung’s introduction of a 128GB 3D TSV DDR4 registered dual inline memory module (RDIMM) last October, the new HBM2 DRAM marks the latest milestone in TSV (Through Silicon Via) DRAM technology. Samsung’s new DRAM package features 256GBps of bandwidth, which is double that of a HBM1 DRAM package. This is equivalent to a more than seven-fold increase over the 36GBps bandwidth of a 4Gb GDDR5 DRAM chip, which has the fastest data speed per pin (9Gbps) among currently manufactured DRAM chips. Samsung’s 4GB HBM2 also enables enhanced power efficiency by doubling the bandwidth per watt over a 4Gb-GDDR5-based solution, and embeds ECC (error-correcting code) functionality to offer high reliability. In addition, Samsung plans to produce an 8GB HBM2 DRAM package within this year. By specifying 8GB HBM2 DRAM in graphics cards, designers will be able to enjoy a space savings of more than 95 percent, compared to using GDDR5 DRAM, offering more optimal solutions for compact devices that require high-level graphics computing capabilities.